The wild turkey is back home in its native habitat in the Carolina mountains, and it is one of the great conservation success stories of our time. It was only through the dedicated efforts and dogged determination of a few wildlife biologists and game managers in the early 1950s and '60s that we have wild turkeys in the mountains. 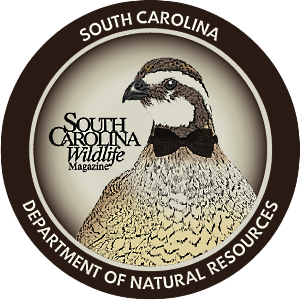 It took several years of false starts and ill-fated attempts at relocating turkeys from the few remnant populations in South Carolina to finally come up with a method that worked. Vernon Bevill was one of those pioneer turkey biologists. Now retired and living in Austin, Texas, Bevill remembers the trials and tribulations of trying to get wild turkeys reestablished in the Carolina mountains and other areas in the Palmetto State. Bevill says that the first attempts at trapping wild turkeys from the Francis Marion Forest involved using baits laced with anesthetic drugs, which could "knock a turkey out for several days and required a bunch of care to get them to recover. We used to give them shots of pure caffeine in the breast muscle to help them wake up," Bevill recalls. Sam Stokes, a retired wildlife biologist from the mountain region, tells the story of keeping one overdosed gobbler in a box in his laundry room for several days until the bird had sufficiently sobered up enough to be released into the wild. That wild gobbler eventually survived and went on to become the patriarch of who knows how many wild turkeys in the Mountain Hunt Unit. Both Bevill and Stokes are quick to point out that, more than anything else, it was the development of the cannon-net trapping method that made the overall wild turkey stocking effort possible. 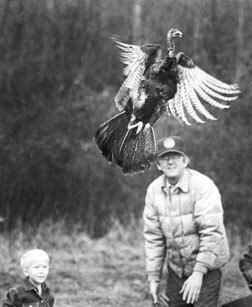 The state's first wild turkey biologist, Herman "Duff" Holbrook, first started working to develop the method as early as 1951, but it took several decades to perfect the technique. Meanwhile biologists tried releasing pen-raised birds, which just did not work out at all. Finally, by the early 1970s, when Vernon Bevill was serving as the state's second turkey biologist, they finally perfected the cannon net, a method that is common practice throughout the country today.